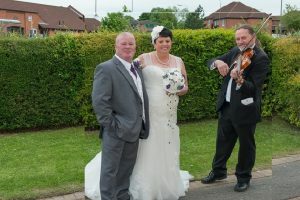 Your wedding is one of the most important days of your life, and music played by a live violinist will make it more special by adding a personal touch. Although you can customise when I play, to make your day personal, the most popular options are ..
Additional charges may be made for travel depending on venue. Asian Weddings Prices can be discussed, but generally start at 200, playing for drinks reception (1 hour), and perhaps bride or groom arrival. Or check out my YouTube channel.